Story: Barbapapa was a being that grew in the garden of François and Claudine. He appeared in the soil where he grew in a shell until he burst into the human world. He tried to fit in, holding several jobs, but eventually got lonely and started searching for someone like him. After searching around the World, he found the female Barbamama back home. He married her and together they started a family, which they grew in their garden. Background notes: Barbapapa was originally a children's book by Annette Tison and Talus Taylor. 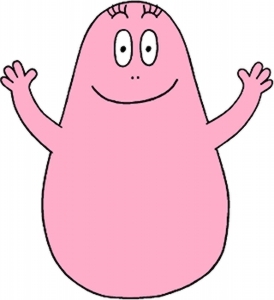 The character first appeared in the book Barbapapa from 1970, where he grew in François' garden and started a family. The name Barbapapa became both the name of the character and the name of the race, and it is a pun on "barbe a papa" which is French for candy floss (direct translation: father's beard). The books became an international success and new books are still produced. The success of the books prompted a series of cartoons that aired in 1974. The series Barbapapa ran 45 episode in 1974. It was produced in 1973, which gives a bit of on confusion regarding first appearance. Though the series Barbapapa is French, the cartoons were a Dutch/Japanese production with the original voices in Japanese by Kaneta Kimotsuki and Noriko Obara. A second series aired in 1977 (48 episodes), and a third aired in 1999 (20 episodes). As a part of the cartoons, several LP's were released containing the songs from the episodes. The details are sketchy, but according to the official Barbapapa site, Barbapapa was also made into comics. The series is an open end series with no numbering and only identified by the title, like the books. So far, 79 comics are listed. The popularity of the series has resulted in a lot of merchandise, ranging from the obvious figurines and teddy bears to slippers, jewelry, coffee mugs and live size reproductions of the Barbapapa house.